AZ Sniper claims you can learn to easily make $1,500 per day through Amazon with this system. 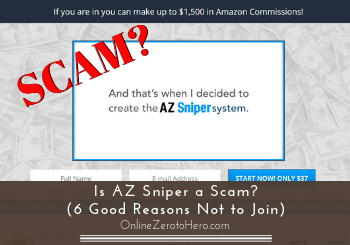 But is AZ Sniper a scam, or is it really a great way to learn to make money on Amazon? Having been in the world of internet marketing for years, I can right away reveal that there are several things that worries me about the claims the sales page makes, and you NEED to know some red flags before joining. This AZ Sniper review will reveal all these red flags, so you know what you are getting into, if you decide to join. 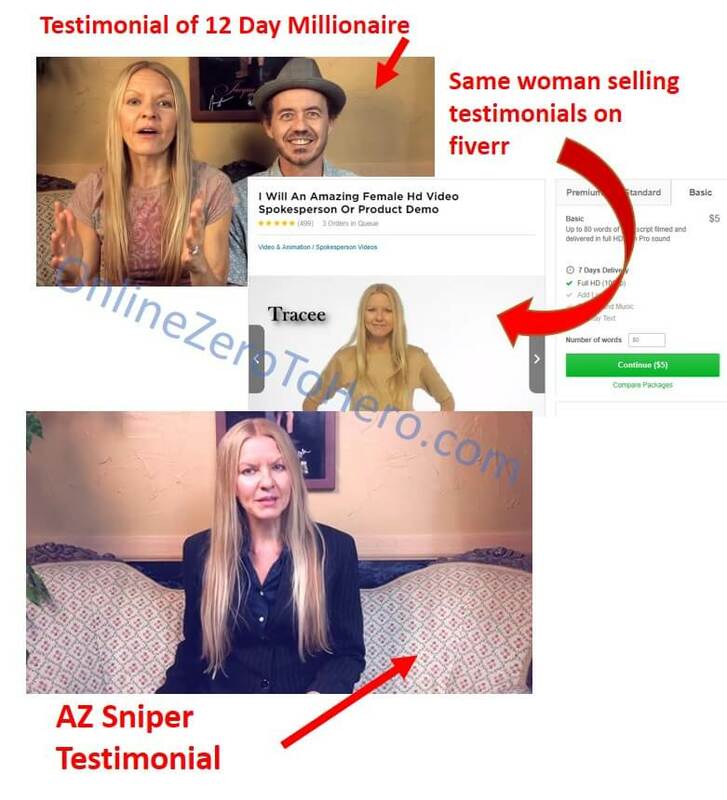 AZ Sniper (also called Amazon Sniper) makes a lot of big claims about how easy it is to make money online. It shows a real way to make money online, BUT it has a lot of red flags. You for example do not know who the owner is, the video testimonials are false, the true price is not revealed before you join, and more. It is therefore NOT a system I recommend. What is AZ Sniper and what does it offer? The idea of the AZ Sniper system (also called Amazon Sniper), is that you will learn to make money on a well-known website that you have probably used before yourself. This website is Amazon, and by using this system, you are supposedly able to earn really good money without much effort. AZ Sniper is supposedly a way to learn to make money on Amazon. You are not told much about how you will make this money on Amazon. But I can tell you that the way you will be making money is through what is called affiliate marketing. It means that you will be promoting products that are sold on Amazon, and when people buy, you will earn a commission. The AZ Sniper is then supposed to make this process very easy, so it is possible for anyone to get started very easily. I have however spotted several big red flags, which are the reason it is not a system I would personally join, and I will show these to you below. But let’s first just go over, if it is even realistic to make money on Amazon like this. Can you make money with Amazon? As you can already see, I have some big concerns about AZ Sniper. However, one thing I like is that it talks about a real way to make money online. Making money as an Amazon affiliate is 100% legit, and it is a real way to make money. It is possible to join the Amazon Associates program for free, and you will then be able to promote any of the products sold on Amazon. If people buy through your promotion link, you will earn a commission. You do not have to own any of the products, and there are products within any niche you can promote. So it definitely is a real way to make money online. BUT even though it may sound very appealing, you need to know that it might not happen as easily as you might think after watching the AZ Sniper sales video. There are many things you are not told, and you need to know these before investing any money. AZ Sniper red flags revealed! Based on my years of experience with internet marketing and affiliate marketing, there are several big red flags when it comes to AZ Sniper. Let me go over the biggest ones below, so you can take this into consideration before you decide to invest or not. These are also the 6 reasons I mention in the headline of this article. Who the owner is, tells a lot about the credibility of a system. When you cannot find any information about the owner, it is, in my opinion, a big red flag. When it comes AZ Sniper there is not much info about the owner. You are just told his name is Stephen Ford – despite being the named founder and creator of AZ Sniper, he is however not seen anywhere on the website. He doesn’t even show his face in the video, and you can read no other information about him. He is just introduced as the voice in the video. The only sign I found about who might be behind this program was in the disclaimer. Here it seems that the disclaimer has been reused from another similar product. Looks like the same person might be behind the AZ Code as well. In the disclaimer, as you can see on the image above, the AZ Code is mentioned instead of AZ Sniper. It is a sloppy error, but it gives us an indication that the owner of these two very similar systems might be the same. However, on the sales page of the AZ Code, the owner is presented as Andrew Petersson. This seems very strange right? Why is the owner not revealing his true identity? This is definitely a big red flag in my opinion. Testimonials and reviews from users are a great way to get an idea about how well a product works. However, when the testimonials are fake, it becomes a red flag instead. And the testimonials in the AZ Sniper video are false. They are testimonial bought on a freelance platform or similar. The reason I know this is that I first of all have seen some of the people giving testimonials in the video in several other sales videos for similar programs. And I have also found them selling this kind of testimonials on Fiverr. One of the guys giving a testimonial in the Amazon Sniper video is also in MANY other similar videos. In testimonials for all of these programs he explains how amazing that particular system has been, and how it has helped him to make easy money online after not having much money. 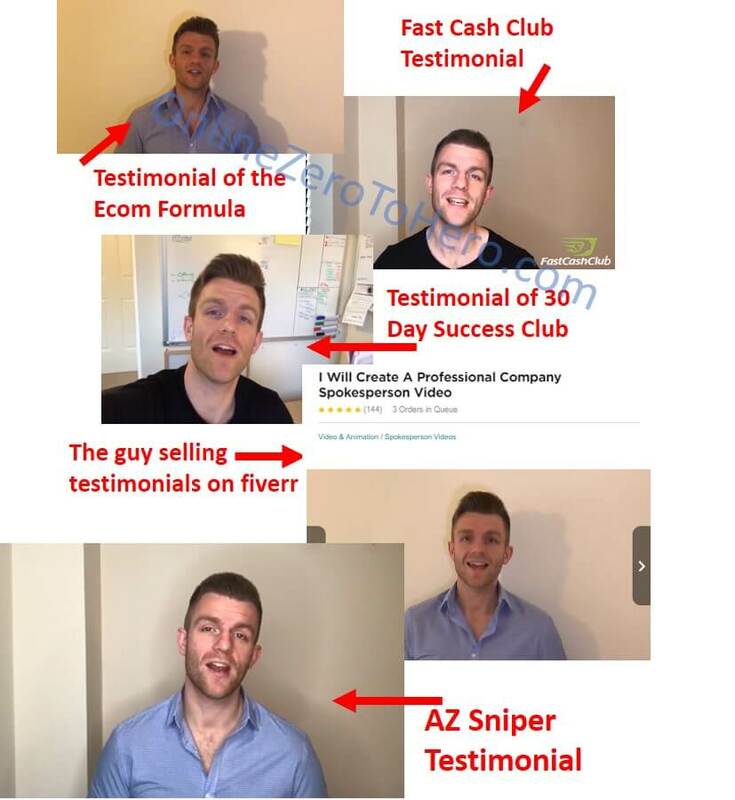 In the testimonial for AZ Sniper, he says he has been unemployed for 8 months and is now making $1,500 per day online with this system. My guess is that he would not be selling video testimonials for $5 if he really was making this kind of money with all these systems, right?